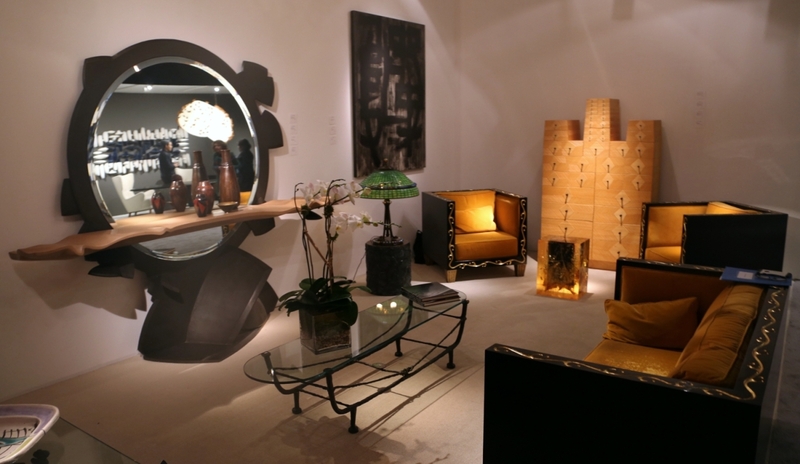 NEW YORK CITY – The ever-fashionable, international world of design found a home inside the heavy double doors of the Park Avenue Armory for the November 10-13 edition of the Salon Art + Design fair. 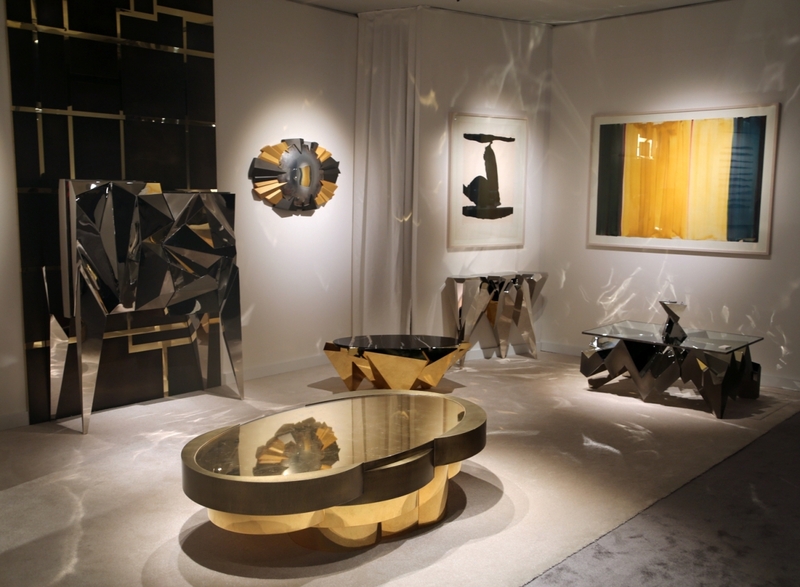 This year’s show hosted 56 galleries, 26 of them domestic, in a glamorous display that combed the international aesthetic across disciplines to form an exhibition of modern progress, one where new forms rise to attention, where debuts are made, and running parallel, one where notable works from the past century are exhibited and redefined alongside contemporary creations. 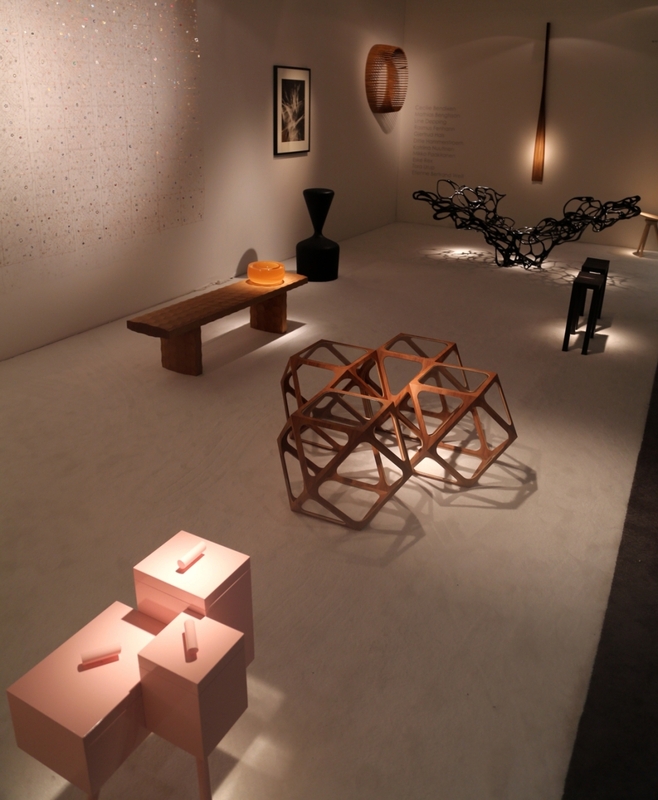 The contrasts found within the show proved a playground to the attendees who return year over year expecting an exhibition of beautiful things – a language that needs no study or guidance. 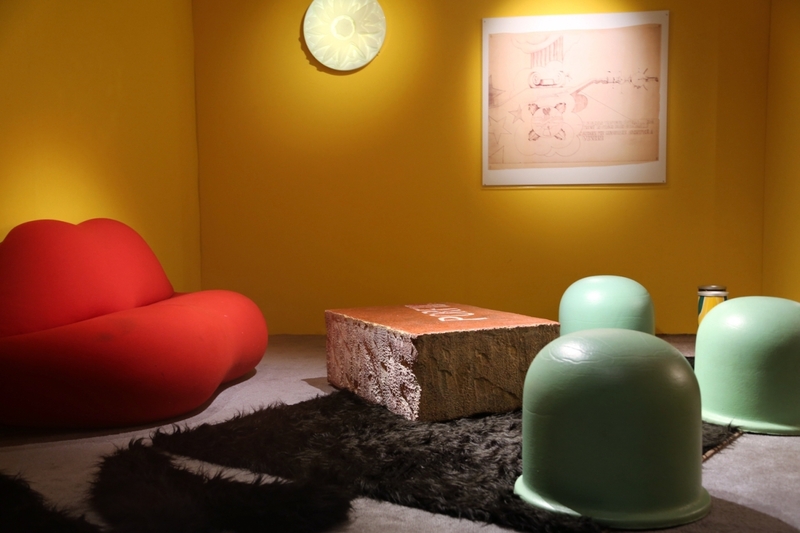 Radical Italian design was found down the aisle from ancient artifacts, works from Louis Comfort Tiffany and Eliel Saarinen were present, as was digital art, Pablo Picasso and Sam Francis. 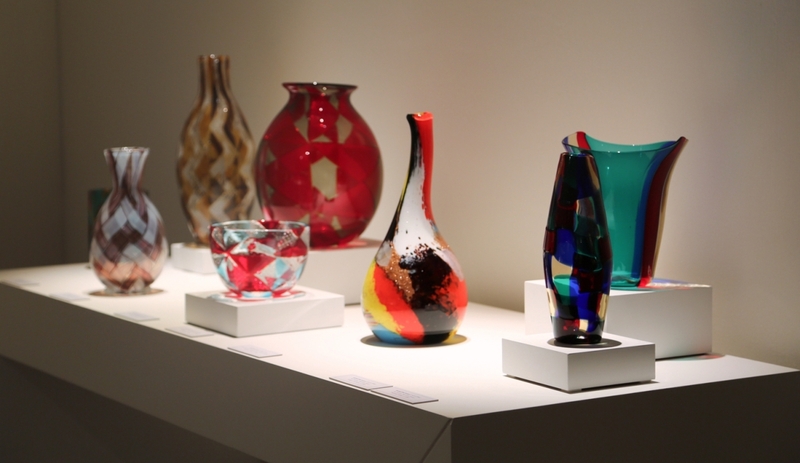 Venetian glass and Japanese ceramics were on tap and, of course, works that have weathered the gauntlet of critically acclaimed design were everywhere, from Jean Royere, Zaha Hadid and Formafantasma to Judy Kenslie McKee, Mattia Bonetti, Zhipeng Tan, Gareth Neal and so many others. 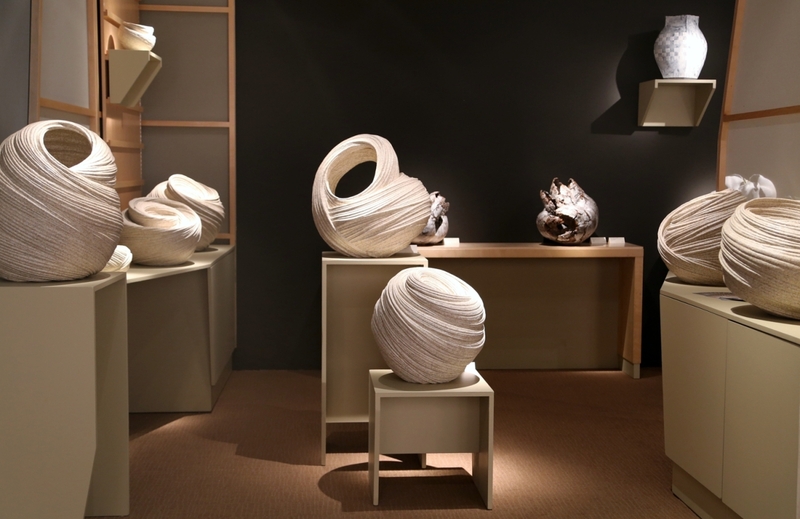 From a studio that sits on a rocky promontory sticking out over the Pacific Ocean, Japanese ceramicist Sakiyama Takayuki, on exhibit in the booth of Joan B. Mirviss, Ltd, New York City, infuses a fluid and swirling vortex into his handcarved and coil built works. Many of Takayuki’s works had sold tags next to their placards during the opening preview, and nearly all had sold by the end of the show. 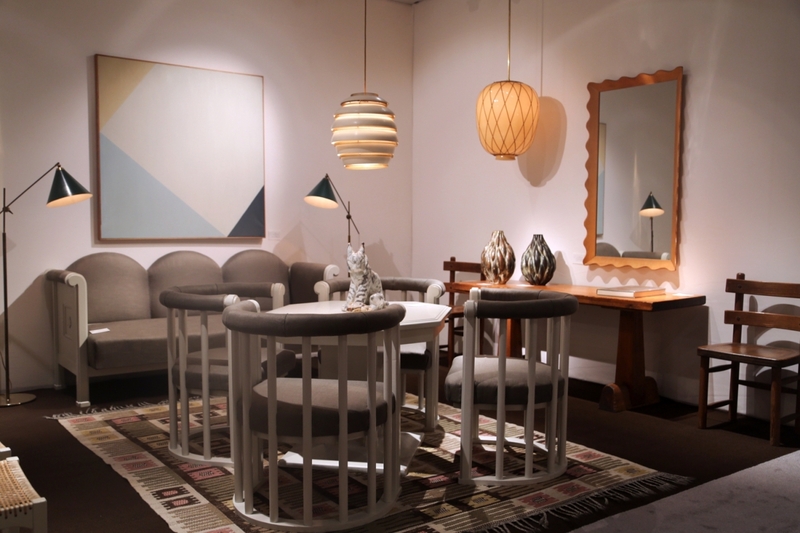 Friedman Benda, in its tradition of exhibiting design with sculptural narratives, debuted the Beirut designer Najla El Zein, whose organic furniture was inspired by life transitions. 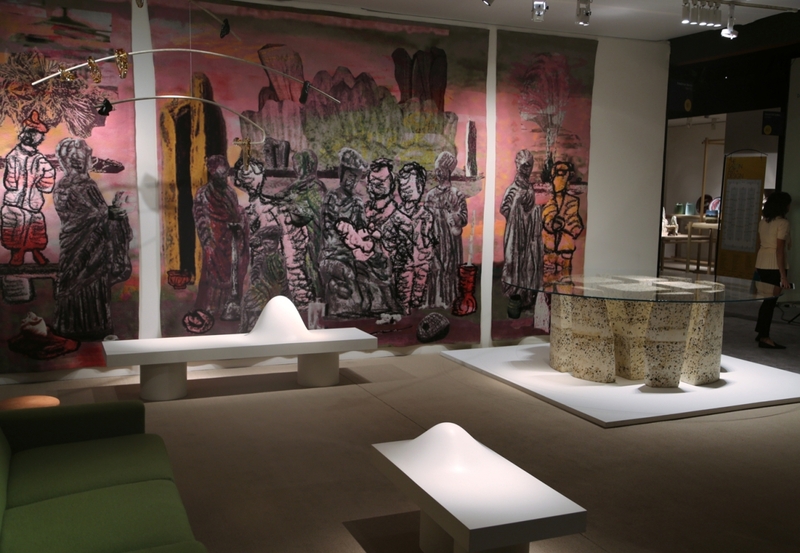 From her “Distortion” series, the fiber reinforced concrete and foam “Distortion Bench 06″ featured a slab platform, from which rose a protruding, rounded cone – a playful balance between the functional and nonfunctional. Faye Toogood’s multidisciplinary talent was on full display in the form of “The Family Tapestry,” a monumental textile triptych, the largest that the designer has produced to date. The work featured a colorful backdrop of pinks and oranges behind boldly outlined figures and was inspired by a Renaissance altarpiece painting. 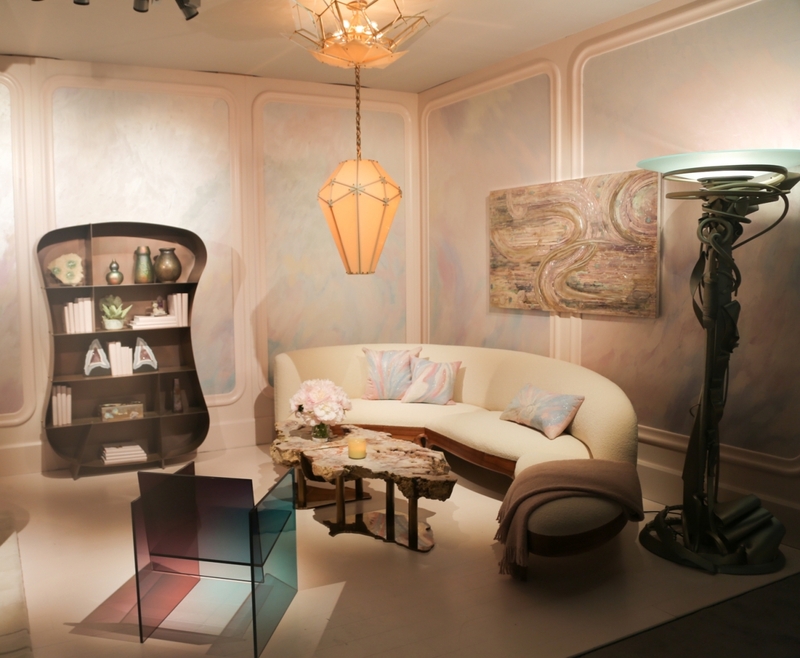 Design from Art Nouveau to contemporary makers was on display in the booth of the first interior designer to ever exhibit at the Salon, environments by Amy Lau, New York City. 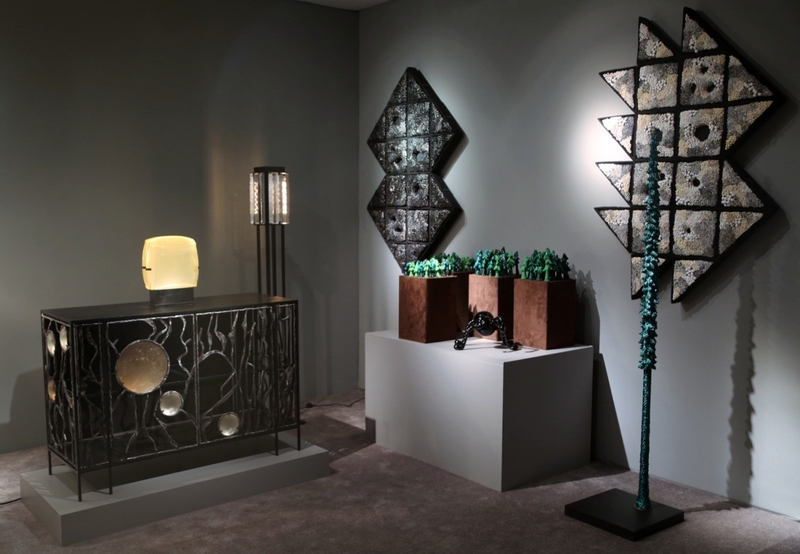 The designer, exhibiting pieces by Louis Comfort Tiffany, Albert Paley, Mary Wallis, David Wiseman, Leon Rosen and Michael Coffey, conceptualized her booth as “New Nouveau.” The booth had a constant crowd of visitors on the opening night who were eager to see a booth with a broader range, something that was uncommon in a show of specialist dealers. 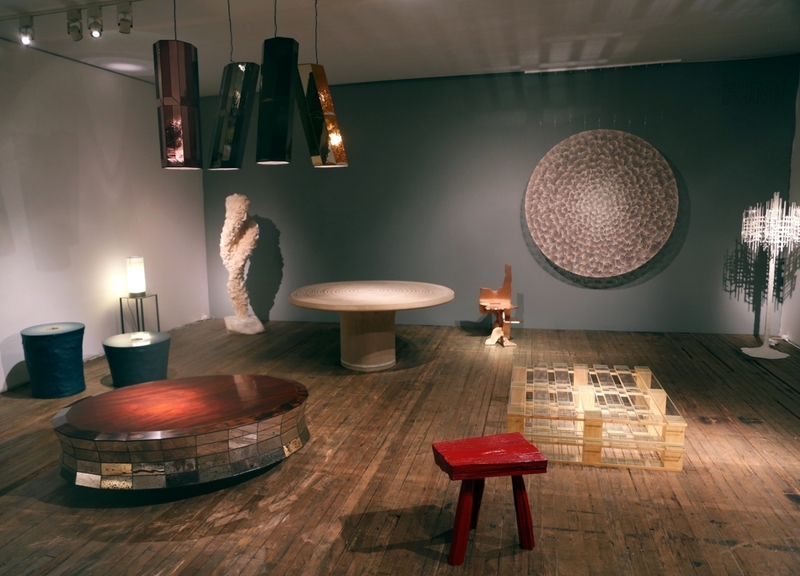 Jim Elkind of hometown New York City gallery Lost City Arts, who took up residence at a different end of the floor than he is used to from his tenure at the Winter Show, marked the gallery’s overdue debut at the Salon with a selection of international design amid large bronze sculptures by American artist Harry Bertoia. 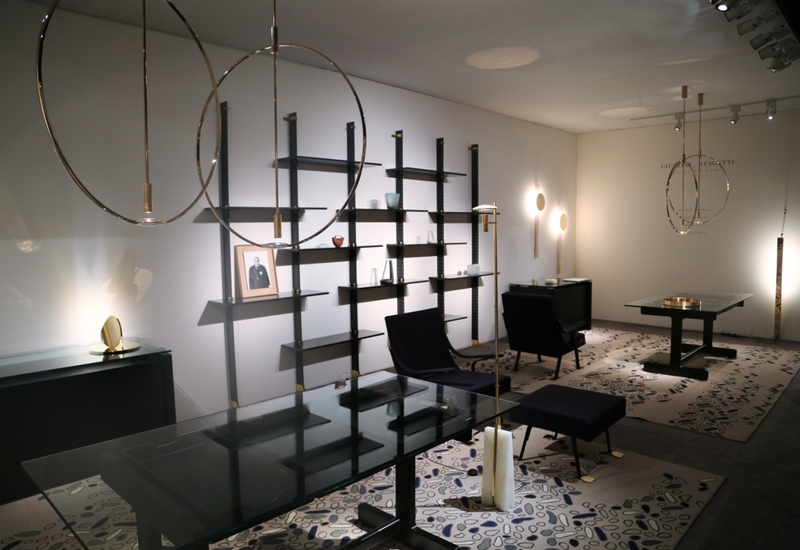 Lighting in the booth was provided by France’s star Twentieth Century lighting designer, Serge Mouille, in numerous forms of sconces, including eye, wall and a “Murale” double rotating arm sconce. 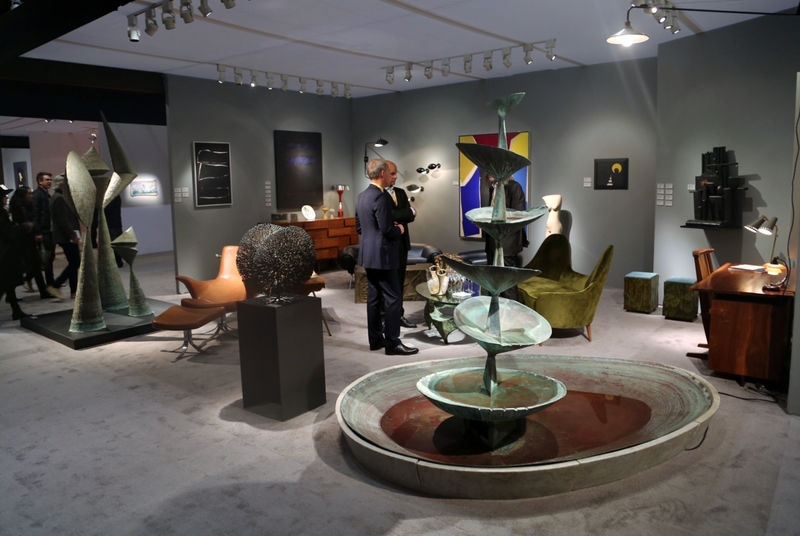 The Bertoia sculptures that sat at the front of the booth seemed as if they sprouted from a forest floor, including a 21-inch-high bush sculpture, a group of three sculptures from Dallas’s Stemmons Towers, the tallest reaching 90½-inches high, and a fountain comprising six pools cascading down like petals off a central stem, which the gallery purchased out of Sweden. Four towering porcelain works from the Dutch pottery Royal Tichelaar Makkum, active since the Sixteenth Century and one of the oldest companies in the Netherlands, with subjects that ranged from a traditional porcelain flower pyramid to a surreal line of works from the 2008 “Pyramids of Makkum” series, lined the front of Gallery Priveekollektie’s booth. 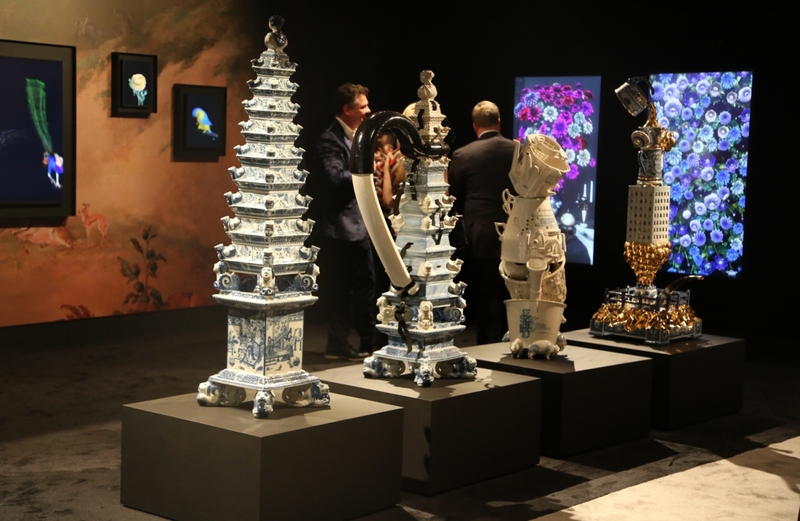 The pieces were inspired by a Seventeenth Century flower pyramid that the pottery helped restore for the Amsterdam Rijksmuseum. 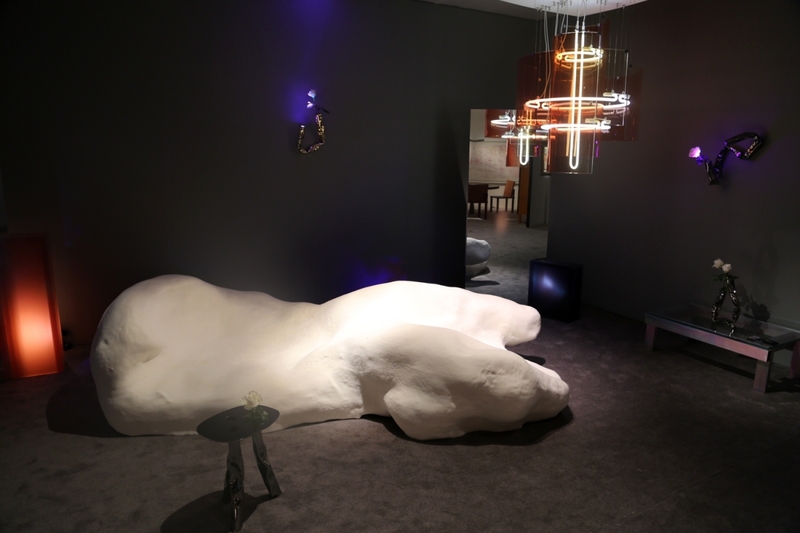 It then reproduced one example from the original, and then asked noted contemporary designers, including Studio Job, Hella Jongerius and Makkink & Bey, to offer their own interpretations, to wild effect. Lining the walls behind was a display of digital art, the only exhibitor to bring material from the genre, by British artist Dominic Harris. The “Bloomed Wall” featured a floral image that could be manipulated by the viewer’s hand motions, moving the petals on the flowers or changing the bouquet altogether. 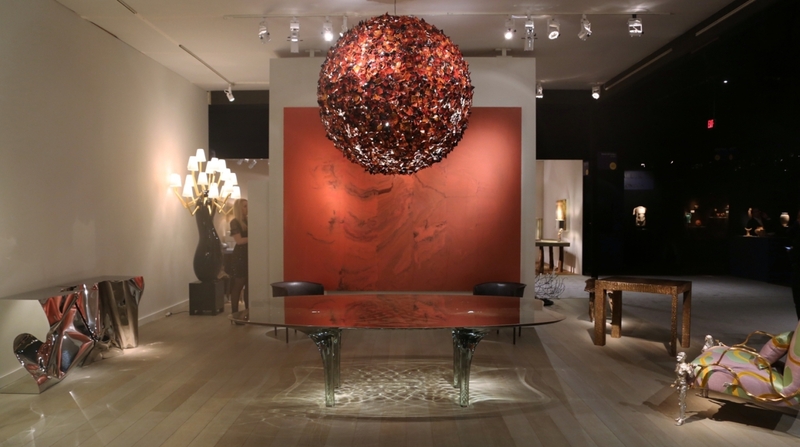 The work was powered by a 4K UHD Screen, multipoint IR touch overlay, 3D sensors, bespoke software, bespoke computer, steel and acrylic. 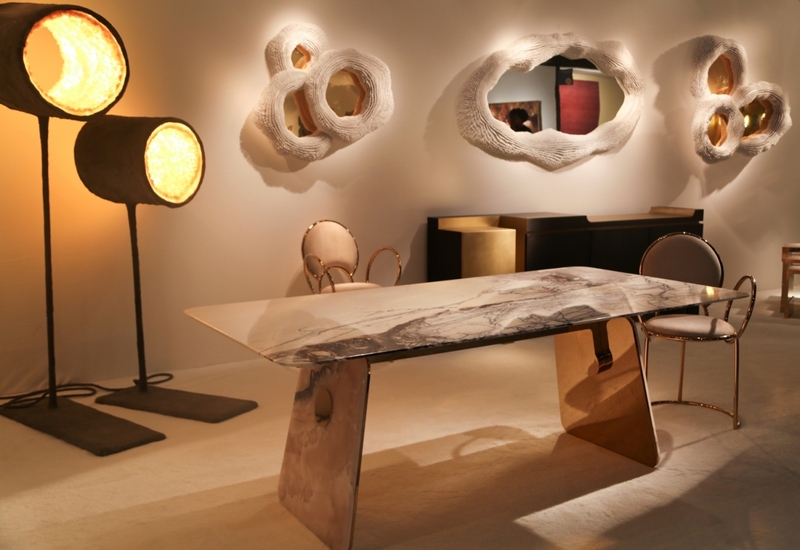 Los Angeles-based Gallery ALL featured a number of furniture works by Zhipeng Tan, a contemporary Chinese designer who casts his pieces using the lost wax technique to create works that emulate organic natural structures like root systems or lotus plants. 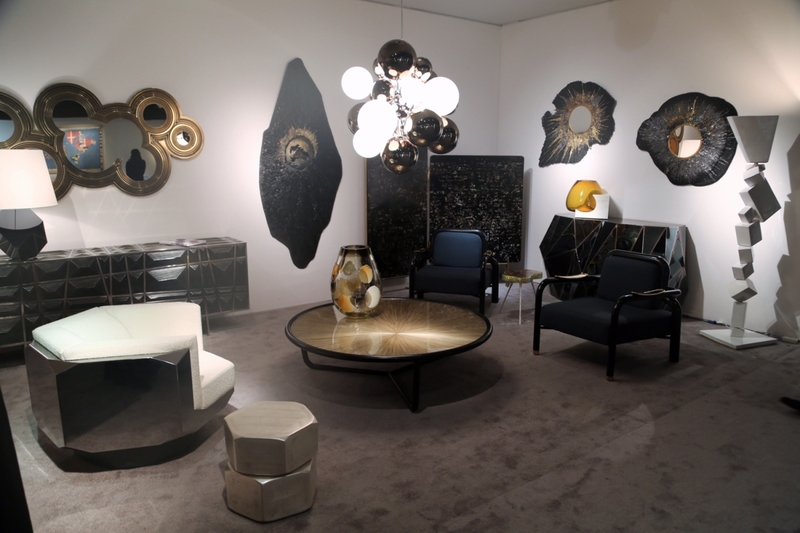 His work features bright metal finishes in stainless steel and brass, underlining a trend in organically shaped, high polished silver or gold metal furniture that the contemporary design world is currently fawning over. 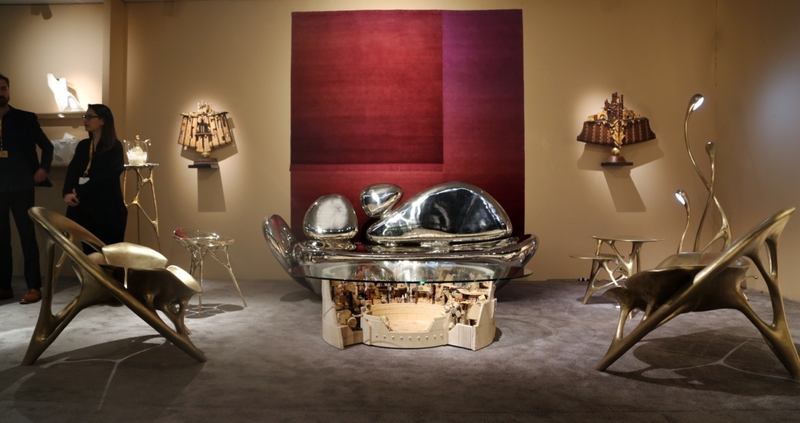 Also of note was a coffee table by Po Shun Leong, a British-born artist based in Los Angeles. 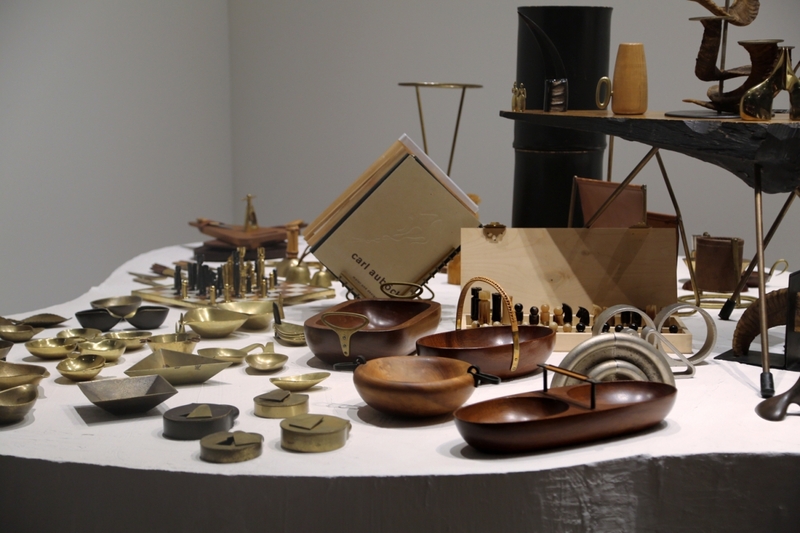 Originally recognized in the 1980s for his intricate wood boxes, the 80-year-old architect-turned-artist now produces furniture works through assemblage, painstakingly crafting each individual piece as part of a larger form. This was evident in his Colosseum Coffee Table, inspired by the Roman Colosseum, which featured a nonrepresentative cutaway view of the interior workings of the building, featuring dozens of stairways, small and detailed architectural elements, some of them falling into the central arena in disrepair, columns, doorways and more. 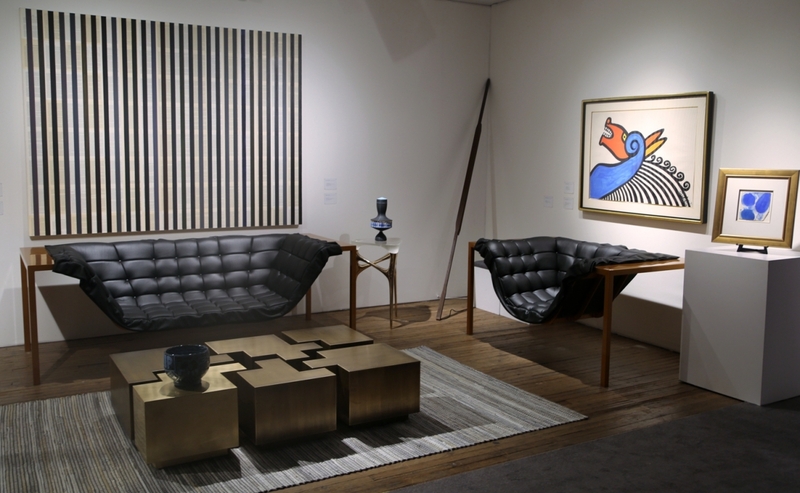 And if contemporary was too overpowering for your senses, New York City-based Bernard Goldberg Fine Arts founded an exhibition entrenched in the 1920s and 1930s. 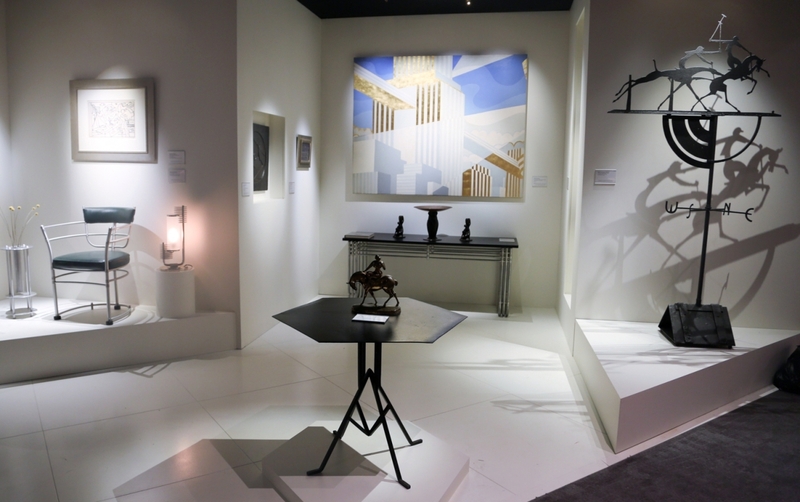 Central to his booth was a William Hunt Diederich Polo Players weathervane, circa 1926 and made of wrought and sheet iron featuring two players on horseback in competition, both players challenging each other for the ball. 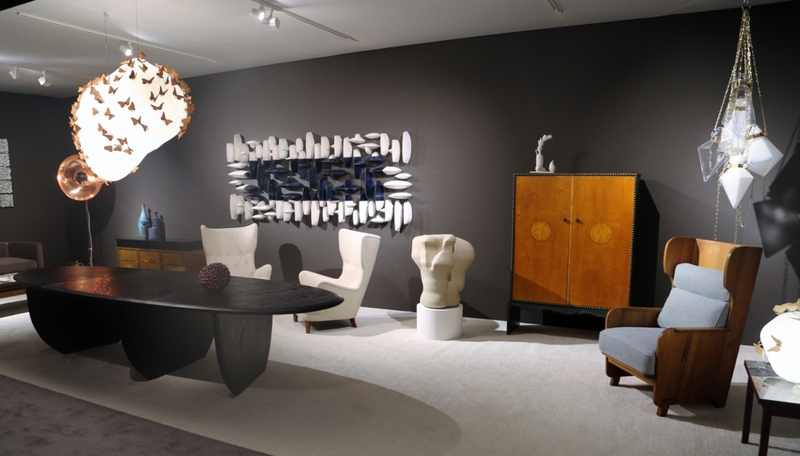 Warren McArthur furniture, in the form of an anodized aluminum console table and a pair of armchairs from the Chrysler Showroom in Highland Park, Mich., were among the designs that accompanied other period fine art, including works by Winold Reiss, Stuart Davis, Jacques Lipchitz and Rene Paul Chambellan. 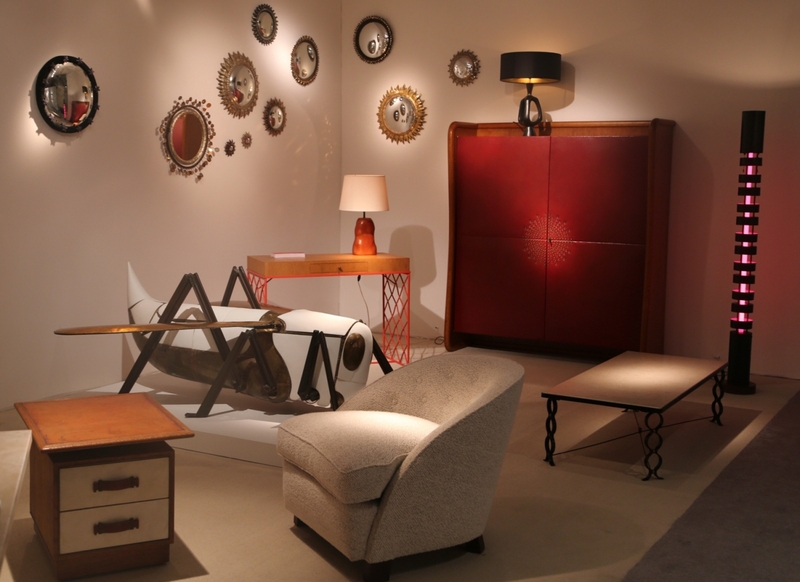 Even though the fair has a low attrition rate among dealers, Jill Bokor still finds ways to reinvigorate the floor each year. And if you walked around the fair, it was hard not to overhear conversations in French, Spanish or Italian on the floor. 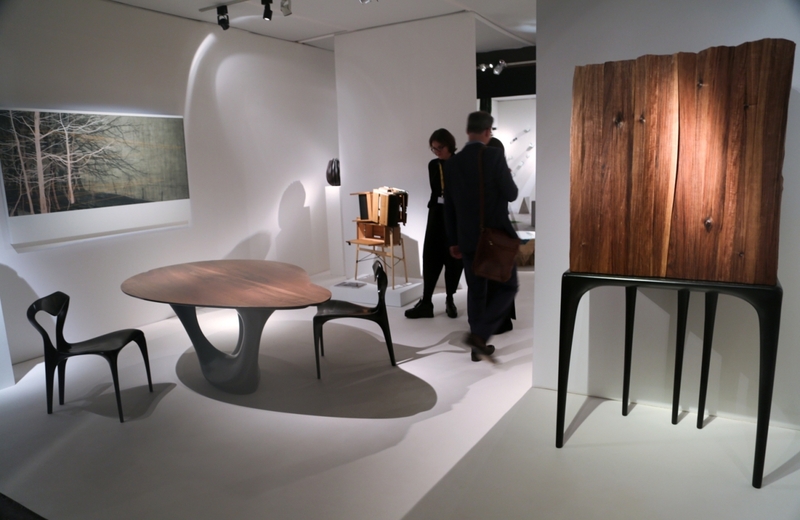 A nod, no doubt, to the international feel of a show that draws interest from around the world. 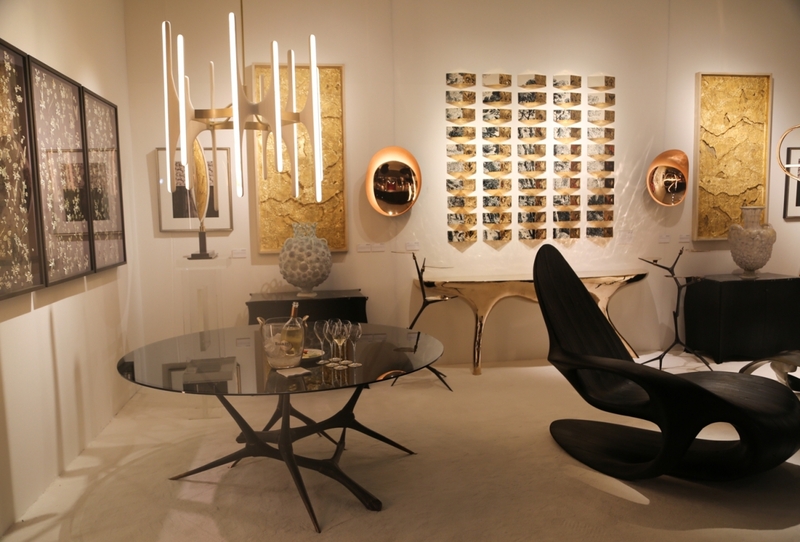 “One of the goals is to bring exhibitors who have not shown in America, or certainly not in New York. I like the idea that our exhibitors aren’t entirely American. I’m very much always on the lookout for something that is not likely to have been seen here,” said Bokor. 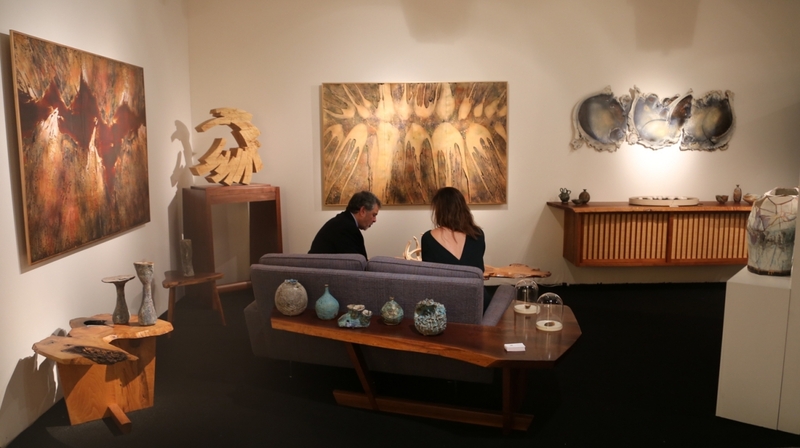 The Salon Art + Design will be back in New York City next year, November 8-12. For more information, www.thesalonny.com or 212-777-5218. 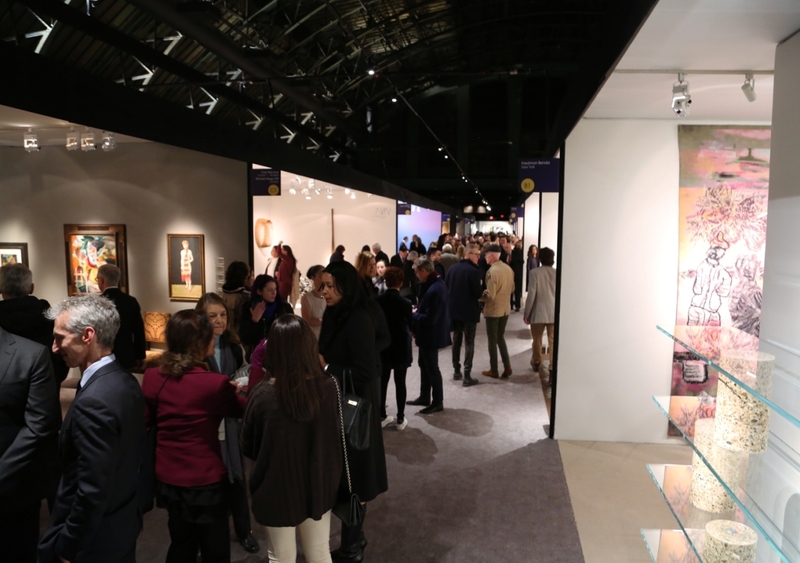 An international base of attendees filled the aisles during the opening preview.